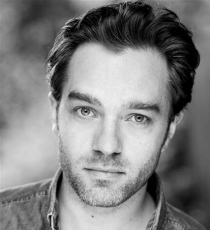 Hadley Fraser is an experienced stage actor with a number of film and television credits. Hadley’s most recent work includes The Winter’s Tale and Harlequinade for the Kenneth Branagh Theatre Company and Long Day’s Journey Into Night at Bristol Old Vic. He has also appeared in television shows such as Holby City, Doctor Who and Endeavour, and can be seen in recent films, The Legend of Tarzan and Murder On The Orient Express.